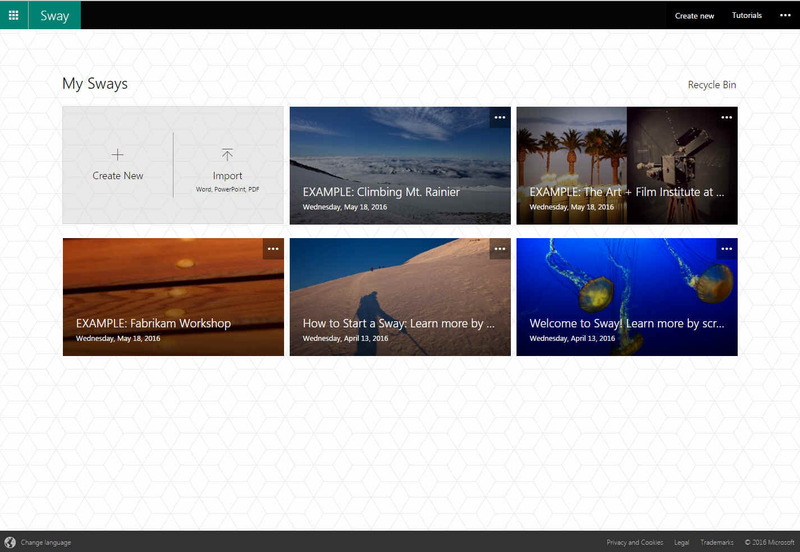 Sway is a free Microsoft application. It can be used to make presentations, reports, newsletters, personal stories, photo albums, and almost anything you can think of. You load Sway by logging in with your Microsoft Office 365 account at JCCC and clicking the Sway icon. You can also get it by going to Sway.com. When you start Sway, you’re presented with a somewhat barren screen containing a black navigation bar and menu on top, along with the option to create a new Sway and some examples. If you’ve drafted any others and saved them to your account, they’ll be located here for easy access as well. Clicking “Create New” will take you to the main attraction. Once you’re actually on the creation screen, Sway’s options are laid out pretty clearly. There are shortcuts to various “cards” representing the types of content you can add to each portion of your project. These include a large number of options you’d expect, like text, pictures and video. However, there are some, like the options to insert Tweets and embed maps and videos from other websites, that show off the forward-thinking nature of Sway. There are clearly labeled options across the top that allow you to switch between various content and design functions. One of the most interesting is “Insert,” which sounds innocuous enough, but actually allows you to select from oodles of online content sources for your project, including Facebook, Flickr, YouTube, Bing and your OneDrive account. 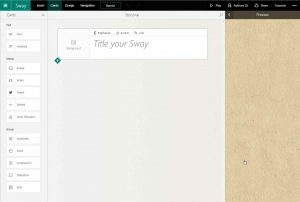 In this introduction to Sway, you’ll learn how easy it is to create and share interactive presentations, personal stories, newsletters, reports, vacation memories, and school or work projects. Great step by step tutorial on the basics. 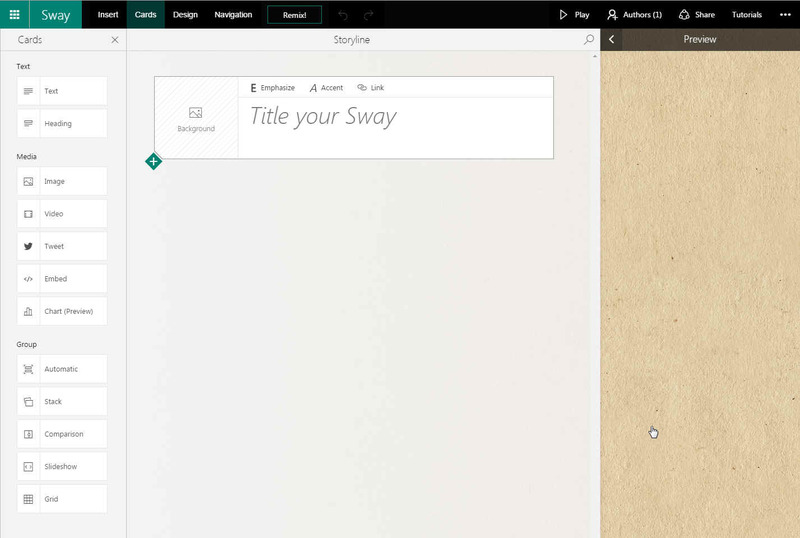 Explore the Sway workflow, including the Storyline, Preview, and viewing the final Sway. This video also covers the Remix feature — a fun and easy way to try out a completely different design. Ever wanted an interactive, modern, and engaging way to explain or teach something to others? This video shows you how you can do exactly that by using Sway. Learn how to use Sway to import and arrange your photos and videos to tell the story of your vacation — or any other personal story you want to tell. Writing a newsletter or brochure, and plan to distribute it online? This video shows you how to make beautiful and engaging newsletters using Sway. Need to give an engaging, modern presentation? This first of two videos shows you how Sway can help you get your message across in just the right way. This second of two videos shows you how to use Sway features like groups, grids, captions, and focus points to make a great presentation even better. When it’s time to share your creations with others, Sway offers a number of ways for sharing your story with the right audience. Learn about your privacy and embedding options in this video. Want to work together with others to create a Sway? This video covers working with multiple authors and even connecting over Skype to collaborate in real-time. Looking to create even richer Sways? This video explores how to control images, stacks, comparisons, and embedded content such as maps, files, and Microsoft Office documents.